Complaint: I found out the hard way do not send them a survey with anything but glowing remarks. This dealer messed up the title paperwork twice. I questioned the $200 cost for some "certified" guy to check things that anyone else does for free. When I tried to schedule another oil change the conversation went exactly like this..."you are no longer welcome at this dealership"..Can I ask why? "you know why" then hung up. Talked to National Rep. He said that all dealers can do anything they want. They only have to do warrenty service. The dealer also lied about providing an oil filter for free. This was part of the "VIP" service that we got for going to a Service course. Beck Toyota doesn't want me as a customer because I completed my customer satisfaction survey honestly and completely. I think that says a lot about them as a dealer. I have never been treated so rudely in my life. I hope this is not how all Toyota dealers are. If so back to Ford. Complaint: I went in to get heater fixed and they stated I needed a part that cost me 300 dollars, a motor for my heater. I was also told then that I needed brakes and fuses, which all came to over 500 dollars. After all this work was done, my heater STILL did not work, I took it to a local mechanic, who is not a toyota dealer and he stated to fix the heater it would cost me 35 dollars for a thermostat. I had my heater repaired for 35 dollars, and when he looked over the work that was supposed to be done by Beck Toyota, it had never had been performed. 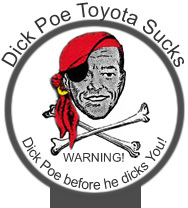 I called Beck Toyota and told them about it and they stated my NEW mechanic had voided any warranty they had on the work Beck Toyota had done, so I was out of luck on complaining to them.